Have you ever tried lettering a card for someone you love but gave up halfway because it was too “tough”? Or maybe you have already tried learning from online resources and videos but your gut is screaming at you that something is off in your work, but you can’t quite put your finger on it? I know. And I totally feel you. I have been there before! But have no worries – I am here to help. Truth is, you can easily google for answers with a snap of your fingers. But it's a noisy abundance of information. You can get various answers altogether and sometimes if you’re unlucky, contradicting ones. Now, you’re right back where you started and have wasted much of your valuable time. This is why I recommend my course to you. I have curated together a well thought-out and cohesive education, and strategically crafted it to guide you step-by-step along the way. You will save time, gain valuable insights and be able to apply what you had learnt from pen to paper. You can't practice what you don't know. Stop second-guessing and know exactly what and how to practice! Today, I want to impart everything I know to you. I had helped numerous people ranging from artists to business owners to curious creatives, learn and grow their lettering journey. And now, I am excited in helping you succeed in yours. "After months of trying to self-learn from PDFs and YouTube vids, I finally understood the basics of brush lettering and started to improve with only ONE class with Leah. Leah is patient, approachable and cheerful. She breaks the fundamentals down into FUN and clear exercises. She's got great notes too! As a teacher myself, I feel that the BEST thing about her is that she is honest and generous with her information and instruction. Others may withhold tips and ideas either to entice you to take more classes with them, or they may do so to suppress competition. But Leah has the heart of a true educator. I highly recommend her." With the onset of the digital age today, humans have a new-found craving for authenticity in things that they watch, read, hear and touch. This is why we see that handcrafted work is having such a huge resurgence today, given that it is done by a pair of hands and not via an automated mass production chain. Handlettering and calligraphy, no less, are riding on this trend and are often used as a vehicle for visual communication, with an added element of human touch and perfect imperfections. In this course, students will be equipped with a solid theoretical understanding on the anatomy of type and by the end of the course, be able to creatively express themselves with the work they create and have a new found appreciation for a creative art form that is greatly grounded in history. 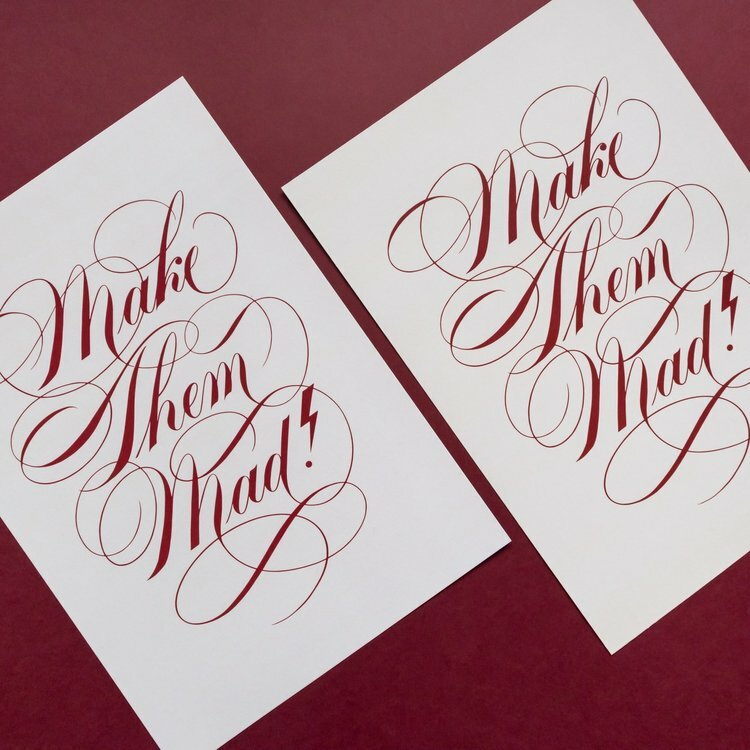 This course is great for both beginners and practitioners alike who seek to utilize a new skill set for custom calligraphy projects - from wedding invites, branding, gifts, stationery design and more. * This class is heavily centred on Copperplate historical roots, theory, execution and application. "I attended Leah's Brush Lettering Course in Singapore in 2019. Her course exceeded my expectations. I am a 4-year calligraphy practitioner from the Philippines but still I learned a lot from her! Her class is loaded with topics. She is very detailed in terms of the explanations and demo. She was able to control the flow of the course, such that all topics were covered and we finished class on time. She is also keen on seeing our strong and weak points. With that, as a participant, I knew where I'm good at and which to work on more. I highly recommend Leah's classes if you want a strong foundation for Brush Calligraphy." We dig deep to the nitty gritty and shed light on the little details that often go unnoticed by others but as a matter of fact, are equally or more important as these little details could easily make or break your work. Assignments will be given each week and I will review and provide personal feedback on your work in the following week. Even though these assignments are optional, frequent practice outside of class is highly recommended. Are you ready to kickstart your journey in the art of writing? I hope that you’ll join me in this value-packed course. Hit enroll and I can't wait to see you in class! What is a class experience like with you? A learning experience in my course is lifelong. Other than the comprehensive and detailed course content, I've a WhatsApp group for all my classes and the learning never stops. Even after the lessons are over, you can send me your work anytime if you're looking for a feedback or critique. I'll be readily available to provide tips on your project pieces. Take it as a lifelong consulting access to me and everyone in the group learns! No worries, I have taught several left-handed students before. You'll be in good hands! What if I want to learn Pointed Pen Calligraphy and not Brush Lettering? This is a very valid question but to me, it’s just a matter of the tools used. You can achieve formal script (e.g. copperplate) and freestyle writing (e.g. modern calligraphy) with either of the two mediums/ tools - dip pen or brush pen, though the former is more commonly associated with formal script and the latter with freestyle writing. I’ve no objections to learning dip pen calligraphy before brush calligraphy, as that was how I started as well. Given my experience, it’ll be a lot easier to make a transition from brush calligraphy to pointed pen calligraphy as the latter requires juggling 2 things at a time - learning the tools AND the writing itself. You’ll experience a steeper learning curve that way. That said, in this course, you’ll be learning BOTH formal script and freestyle and all notes given in class can be used with BOTH dip pen and brush pen. What kind of styles will be covered? Pablo Picasso once said, "Learn the rules like a pro so you can break them like an artist". In my course, I will cover content following rules and guidelines first much akin to formal script before teaching you how to break them to uncover a unique style of your own and freestyle it. What if I am unable to attend class after purchasing? Unfortunately, class is non-refundable after purchase. However, I understand that everyone's busy and schedules change. You can opt to join other classes, depending on availability of classes and slots. However, I seek your understanding in informing me via email or text at least 1 week in advance so that I can better prepare the materials for class. Ask away! I'm happy to answer any specific questions you have - just shoot me an email and I'll get back to you ASAP. I'd never want you to waste your time or money on a course that's not going to truly benefit you, so if you're sitting on the fence or unsure if it'll meet your learning needs, don't hesitate to reach out to me. Enjoy an exclusive 10% discount off the workshop fee as Friends of Funan. Quote “FUNANSGXLEAH”. *Only applicable for classes at Funan Showsuite. Enjoy an exclusive 10% discount off the workshop fee as followers of lyf. Quote “LYFXLEAH”. *Only applicable for classes at lyf@SMU. Read my 5.0 star reviews below or on my Facebook Page here! I'm proud to say I've shared my expertise to many students from local Singaporeans to visiting tourists, calligraphy beginners to seasoned practitioners, casual hobbyists to business owners from other fields and ages ranging from 6 all the way to 60 +. My youngest student, he's only 6 years old! If you're keen in picking up calligraphy/ lettering in a more private and intimate setting with complete one-to-one attention and guidance throughout the entire class or if you're curious in not just the fundamentals but want to pursue other specific areas of calligraphy/ lettering (such as composition, flourishing etc. ), I am happy to provide private classes to meet your specific learning needs. Or if you want to take a private class exclusively for just your group of friends (maybe say for a hen's party or birthday party? ), hit me up and we will make it happen! Specifically, I've taught several private group classes for young kids aged 6-12 as well. Usually, they're kids in the same peer group at school and I'd suggest a private group class if possible for them to be in a comfortable setting of similar age group and same pace of learning and style. If you're a company or event organizer looking for a workshop to enrich your employees with an added creative skill set or for them to simply unwind over beautiful hand-made letters and light-hearted conversations, I'd love to come by to make that happen for you and your team - from shorter duration activity-based workshops to longer duration skill-based workshops, to your convenience. I'd love to work with you in supporting the holistic development of your valued people. "In the beginning when I came across Leah's website, I was hesitant because nobody I knew had taken a lesson with her before and all I had to go by was the website. However, when I contacted her, Leah's warm yet professional manner of communication and her willingness to create the best experience for the students convinced me. She promised and she delivered. She was very engaging. The workshop was a good learning experience according to the students when we took feedback from them. It was convenient as all the materials were provided by the instructor. She made sure the pace was suitable to the whole class and went around to check their work, point out errors and suggest areas of improvement. Apart from her technical skills, Leah shared her passion for her art and also her journey of self-discovery. The workshop was value for money and Leah is someone you will love collaborating with and learning from." P.S. Meanwhile, here’s where to find me — Facebook | Instagram | Click here to join the family!